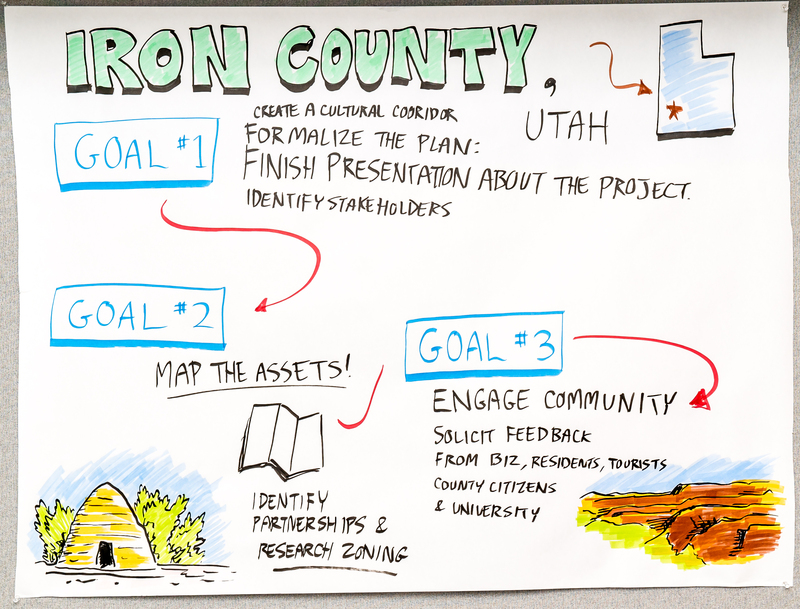 Once the richest county in Utah, Iron County has faced a tough economic climate since the local iron mine closed in the 1980s. The closure left the community without an economic identity. Residents have since rallied around other sectors, including tourism, education and the arts. Cedar City, the largest city (pop. 31,000), is situated among five national parks, including Zion and the Grand Canyon. These natural wonders—and the Utah Shakespeare Festival—have brought millions of tourists to the area. The county has already coordinated several grassroots efforts to provide public spaces to revitalize, beautify and repurpose Cedar City’s struggling downtown district and engage residents, students, and tourists in the community arts. There is a disconnect, however, between the residents of Iron County and its visitors. Iron County is one of five counties in the state dealing with intergenerational poverty while its visitors tend to come from affluent communities. The county is looking to bridge this socio-economic divide and better engage its rural residents by establishing a cultural corridor between the University’s Beverly Center and Cedar City’s historic downtown district. Goal #1: Formalize plan and identify stakeholders. Finish presentation and project description. Set up a poster and/or station for initial public comment, aiming for tourists. Goal #2: Map the assets. Goal #3: Engage community stakeholder. Within the identified cultural corridor. On the Southern Utah University campus and at the Beverly Center for the Arts. From the community at large, including the rural unincorporated areas of the county.